Unrealistic presents new works by Evi Grigoropoulou in which the artist's exploration of the materiality of paint in a series of abstract paintings on square canvases results in works that emphasise the medium's essential properties: line, colour, and flatness. Grigoropoulou's residency at 501 Artspace in Chongqing, China is the catalyst for works in Unrealistic such as Untitled (2012), a picture of a mop which pays reference to the accoutrements of the studio where the artist lived and worked for a month in August 2012. In addition to works with illustrative content such as Untitled (2012) are Grigoropoulou's abstract works whose subject is the medium of painting itself. 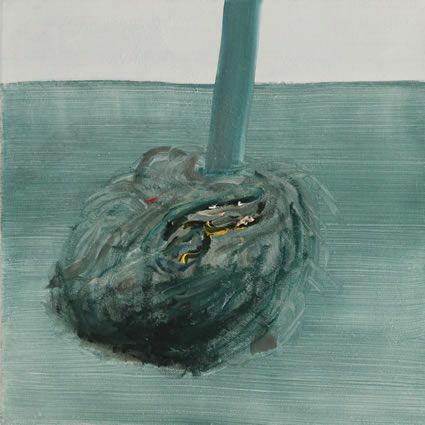 Stripped of illustrative content, Grigoropoulou's paintings consist of those conditions intrinsic to the medium  line and colour  in works that investigate the impetus of their internal logic through a reduction to an ontological essence in order to probe the nature of the medium and its limits. As such, Grigoropoulou's works constitute meta-paintings, that is, they are paintings about painting. In Unrealistic, the artist employs a labour-intensive process that involves the use of tape and oil paint to create vertical lines on the surface of the canvas. Each line's orientation mimics the shape of the canvas and, as such, its rectilinear composition serves to heighten the sense of the canvas's condition as a flat surface; in turn, Grigoropoulou's works come to typify what constitutes meta-painting as painting about painting itself. Evi Grigoropoulou (MA Fine Art, Manchester Metropolitan University, 2010) is based at Rogue Artists' Studios in Manchester. Her exhibitions include Salon Art Prize 2011, Matt Roberts Arts, London; Young Manchester Artists (2011), Galleria FaFa, Finnish Academy of Fine Arts, Helsinki, Finland; Apocatopia (2009), Castlefield Gallery, Manchester; Pressure Points: Between Tracks (2009), Badhaus, St Gallen, Switzerland; and A Discreet Music (2008), The International 3, Manchester. Grigoropoulou's curatorial projects include Straw Poll (2009), Sounds from the Other City, Salford. In 2012 she completed a residency at 501 Artspace, Chongqing, China with the support of Arts Council England and the Chinese Arts Centre, Manchester. Unrealistic is the artist's first solo exhibition. Evi Grigoropoulou is represented by Untitled Gallery. Untitled Gallery wishes to thank Chinese Arts Centre and Pavel Büchler (Manchester Metropolitan University) for their support.